Once you’ve chosen your worktop material, the next task is deciding on your finish. A ‘polished’ finish is pretty self-explanatory, but honed, satinato, antiqued, carezza!? What are they all about, and how do you know which finish is right for your material, which finish will complement the look you’re after? 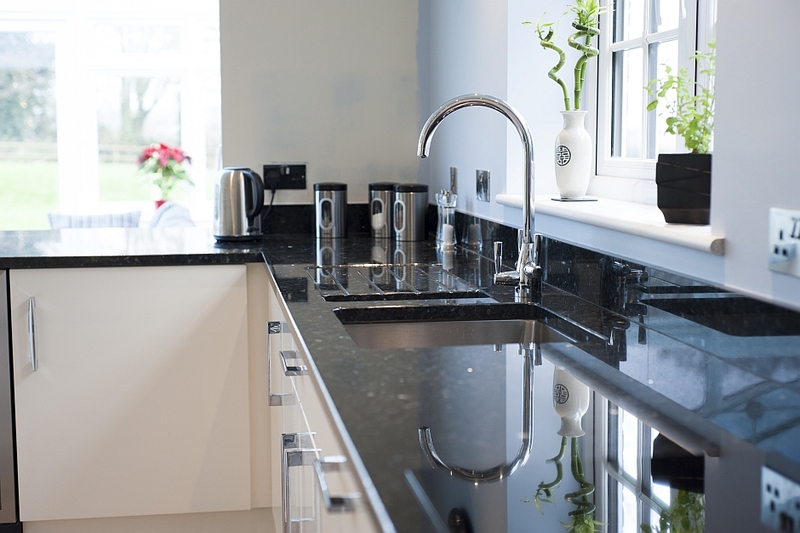 The first thing to note is that varying worktop finishes are simply the result of differences in process and do not affect the hardness or durability of the material. With natural material, during the production and preparation of each the slab, the variation in the finish is created by the number of ‘passes’ that are made with a series of grades of polishing heads. For example, a slab with a honed finish will have had two fewer passes than a polished finish – which is why the honed result is a subtler, matte look with minimal sheen. A satinato finish, is a finely textured satin finish, which has a different pass on it from honed or polished, it is created with diamond brushes that are much coarser, creating a leathered ‘orange peel’ texture. Caressa is a different finish again, where the slab is double polished and then brushed so you get some levels of polish and some of satinato creating an intriguing almost watermarked appearance. So, honed, satinato, carezza, are all just a question of different processes and different brushes. Varying finishes do, however, create entirely different looks and so it’s really important to think through what you’re after in your worktop so we can help you achieve your desired look. Can I have any finish on any stone? Theoretically yes, but in reality, some materials are better suited to certain finishes than others. Marble is a calcite, and therefore will react with acids! Therefore, we suggest that if you choose to go for a natural marble worktop (a wonderful choice) you start with it as honed or satinato. Why? Because, if you spill anything too acidic on polished marble it will react with the stone and mark the polish so that when the light catches it you get a pesky blotchy mark. With a honed/satinato marble or limestone (similarly a calcite), this is not a worry. Most manufactured quartz materials, like our Teltos range, are ready sealed, polished and impervious to stains, which means no panicking about a cheeky child with a marker pen! All our Teltos colours come with a flawless polished finish, with the exception of ‘London Grey’ which has a satinato finish to emanate the currently on trend ‘concrete look’. When it comes to granite worktops the finish is really a matter of personal preference. Some people don’t fancy a high gloss finish and may opt for a more muted honed look, or vice versa. is certainly a factor to consider. As a general trend, up until around 10 years ago, many houses suffered from insufficient natural light. Now, with a surge in skylights, floor to ceiling windows and kitchen extensions, light is no longer always an issue. For example, a conservatory kitchen with plentiful natural light may lend itself perfectly to a matte honed finish. The style of your kitchen cabinets is also a key consideration. High gloss contemporary cabinets, in ivory and white especially, are all the rage in current kitchen design and a contrasting honed worktop would complement them perfectly. Likewise, more traditional shaker cabinets work wonderfully with a polished modern quartz top for a ‘trad-temporary’ look. And most importantly – consider the big picture! Remember it all needs to work together! When choosing your worktop material and finish we would strongly advise you to bring your cabinet doors and if you’ve already selected flooring, bring the flooring, plus anything else that’s relevant: accent colours, fabrics etc. It’s so important to visualise ‘the big picture’ when it comes to your new kitchen! 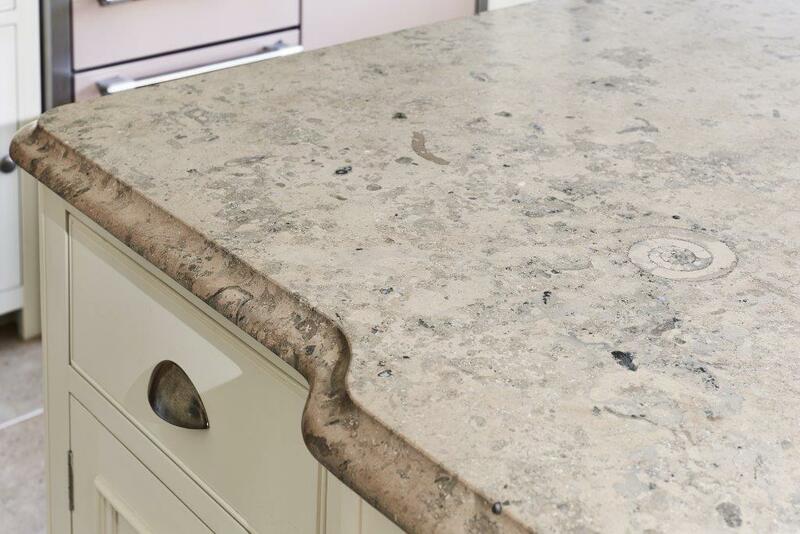 The most important advice we can give you when choosing your worktop material is please never choose your stone from a 100mm x 100mm sample whatever you do! A new worktop is a big investment and it’s crucial you see whole slabs where possible or photos of the slabs if it is a special order material we will be importing for you before making the all-important decision. It’s rather like buying a small tester pot of paint, you put a little dabble on the wall and it really is hard to tell. Then you paint a bigger area and think ‘oh no too dominant’…! It’s exactly the same with stone, be it engineered or not. Yes, engineered stone is, of course, consistent, but you still need to see the concept of the bigger piece. Pay that extra attention, it’s worth it!